Do you have piles of expensive magazines stashed around your house? Do you sometimes find it inconvenient to visit the Library to access your favorite periodicals? Check out Flipster, the Williamson County Public Library’s new digital resource that gives you instant access to popular magazines on your computer, smart phone, or tablet. It’s as easy as flipping a page . . . there’s no clutter . . . and it’s FREE! You can choose from 57 different magazines on a variety of subjects covering sports, business, entertainment, home and garden, men’s and women’s health, food and cooking, news and politics, and travel. Go to WCPL’s website (wcpltn.org) and click on the eLibrary box on the homepage. Scroll down and click on the Flipster link on the left side of the screen. In the top right corner of your screen, click Sign In. Enter your library account number in the box and click Login. You’re now signed in and you can start reading free digital magazines on your computer! Download the Flipster app on your smart phone or tablet from the App Store or Google Play Store. Open the app and click Get Started. In the Find My Library box, click Allow to let Flipster search your location for nearby libraries that offer Flipster. Then lick Log In next to Williamson County Public Library. Enter your library card number and click Login. You can now start reading digital magazines on your smart phone or tablet! Search for a specific magazine by title. Browse for magazines by subject. Scroll through all magazines by clicking the right arrow. Simply click on the magazine cover to open it. Click All Issues to see other editions of the magazine. Click Pages to see thumbnail images of all the pages in the issue. Zoom in or out on a page by clicking the zoom buttons. Click the right arrow to advance to the next page or click the back arrow to go back a page. That’s all there is to it! But if you’d like additional information on using Flipster, to go https://ebsco.libguides.com/flipster/flipsterapp, where you’ll find more detailed instructions, tips, FAQs, and video tutorials. With Flipster, you can free space taken up by paper issues of magazines, save money on the cost of subscriptions, and read your favorite magazines whenever and wherever you’d like. Enjoy your digital magazines! Would you like to download eBooks, eAudiobooks and comics, stream movies and TV shows, and listen to music through one source – for FREE? Welcome to Hoopla, the Library’s newest digital resource! You can enjoy Hoopla’s hundreds of thousands of titles on your computer, tablet, or smartphone! And guess what? On Hoopla there are NO WAIT LISTS and NO LATE FEES. Setting up a Hoopla account is simple. Download the Hoopla app on your smart phone or tablet from the App Store or Google Play. You can also create a Hoopla account on your computer on the Hoopla website (https://www.hoopladigital.com/). Click Get Started Today and follow the onscreen prompts to sign up for your new account. If you’re on your computer, you’ll need to click Allow Location Access. On a smart phone or tablet, turn on Location Services in your Settings. This allows Hoopla to identify the location of your library. You’ll be asked for your email address and password. Make up a password (not your library card number). After reading Hoopla’s terms and agreements, click Agree. Once you’ve entered your email and new password, Location Services will search for libraries near you and display several. Choose Williamson County Public Library. You will then be prompted to enter your library card number and PIN. Your PIN will be the last four digits of your library card number, unless you have changed it in the last couple of months. That’s it! You can start browsing for titles and begin streaming or downloading immediately. If you run into trouble setting up your account, call the Reference Desk at 615-595-1243 and Reference staff will be happy to help you. You can also check out some instructional videos from Hoopla Digital on YouTube: https://www.youtube.com/user/hoopladigital/videos. These videos demonstrate how to use Hoopla on a variety of devices, including your TV. Or search by title, author, artist, or series. Click BORROW to check out the title or click the HEART to add it to your favorites. Click READ to begin your book. If you’re using the Hoopla app, when you log in you’ll see your “My Hoopla” page. Click an icon at the bottom to browse through the genres or click the magnifying glass to search by title, author, artist, or series. Click the question mark for “how to” instructions and tutorials, and as you browse through the different genres, you can add titles you’d like to borrow in the future to your Favorites list. Click the HEART to access your Favorites. When the search results are displayed, click the cover of the title that you’d like to borrow. Click BORROW and then click READ to begin your book. You’re allowed to borrow 4 titles a month. But as a special bonus from WCPL, you can borrow 8 titles until the end of March 2019. So get started right away! That’s really all there is to it! Enjoy! Most of this waste could be composted instead of ending up in a landfill. Most of us don’t realize how much food we waste each year. It’s awfully easy to toss leftovers and less-than-perfect produce into the trash. Wasted food numbers are staggering. It’s estimated that in the U.S., 72 billion pounds of still-usable food (worth $218 billion) goes to waste each year and that approximately 25 to 40 percent of food grown, processed, and transported in the U.S. will never be consumed. Much of this food that is still safe and edible could be used to feed hungry families or be composted. But according to the EPA, approximately 94 percent of it ends up in landfills, where it takes up a lot of space and generates methane, a potent greenhouse gas. Let’s take a look at a few simple things we can all do to help reduce food waste, and then focus on one of the best methods of utilizing uneaten food – composting. Several local organizations are on a mission to “rescue” unused food to feed hungry families and divert it from landfills by methods such as composting. Second Harvest Food Bank and the Nashville Food Waste Initiative work with businesses, food service companies, farmers, and individuals to gather food before it goes to waste, distribute it to groups serving the hungry, and keep it out of landfills. Sustainable America suggests ways to become involved in food rescue. Their websites (listed at the end of this article) offer a wealth of information about how we can help in these efforts. Plan weekly shopping lists carefully to avoid buying too much food. Think of all the money we can save if we buy only as much food as we can use. Consider how many meals we’ll eat at home in a week versus the times we’ll eat out. Think about how many meals can be made with each food item and shop accordingly. Don’t buy in bulk unless all the food can be used before it spoils. Learn how to store different fruits and vegetables properly to keep them fresh longer and preserve or freeze what can’t be used immediately. Shop in the fridge first! Use what’s already there before buying more. Learn the difference between “sell by,” “use by” and “best by” dates. Get creative using safe edible food parts not usually eaten, such as vegetable scraps, in casseroles, stir-fries, and soups. Some inedible food will remain even with careful planning, but much of it can still be diverted from landfills. One great way is to compost. Most of us can create a compost pile in our own backyards or at least collect waste material to be taken to a composting facility, such as Compost Nashville. Enriches soil, helps retain moisture, and suppresses plant diseases and pests. Encourages the production of beneficial bacteria and fungi that break down organic matter to create humus, a rich nutrient-filled material. Reduces methane emissions from landfills and lowers your carbon footprint. There are many different ways to make a compost pile. WCPL and its branches have several books on composting and there are many detailed composting instructions available online. Watch the WCPL website (wcpltn.org) for information about a program on composting coming in August 2019. Here are a few composting basics. Composting can be done in a simple pile, a DIY wooden structure, or a commercial unit like this tumbler. Select a location with good drainage that is easily accessible from your kitchen. Choose a partially sunny or shady spot. Too much sun will dry out the pile and total shade may keep it too wet. Your compost unit can be as simple as an actual “pile” of materials in your yard, or you can build or purchase more complex composting devices such as various bins and tumblers. You can also compost indoors with worms, using special stacked worm bins. Eww! Begin your pile with equal amounts of browns and greens added in 4-inch layers. You could also just toss them in haphazardly, but the decomposition process will take much longer. Water the pile. Keep it moist but do not let it get soggy. After the initial setup, add greens and browns as they become available. Cover fruit and vegetable waste with several inches of compost materials. Yard debris will decompose more quickly if it is broken into small pieces. Stir the pile occasionally with a shovel or pitchfork. The compost process can take anywhere from three months to two years. Compost is ready when it looks like very dark soil and has a sweet, earthy smell. To test it, put a small amount in a plastic bag. Sniff before sealing. Reopen the bag after a few days. The sample should smell the same as it did before. If it smells worse, your compost needs more time in the pile. Compost is an amazing amendment to your garden soil and can be applied in several ways. Think of it as food for dirt. Spread it over your lawn to nourish the grass, or mix it into garden soil. Give your vegetable garden plenty of compost in the fall. Spread several inches of compost on top of the existing bed, then till it into the soil in the springtime. Put a handful of compost in each hole when you’re planting. Once plants begin to grow quickly, you can add a half-inch layer of compost around the base of the plants. Provide “heavy feeder” plants such as tomatoes, corn, and squash with 1/2 inch of compost monthly. Adding compost to your garden soil can produce beautiful, healthy plants. In the spring, loosen the top few inches of annual and perennial beds and mix in a 1-inch layer of compost. In the fall, apply a 1-inch layer of compost as a mulch to protect plant roots from freezing and conserve moisture. Nutrients in potting soil may be depleted as plants grow. To replenish them, add an inch of compost to potted plants and window boxes twice a year. You can make your own potting soil using two parts screened compost to one part sand or perlite. Brew a compost “tea” by steeping compost in water and use it as a foliar spray or a soil drench. Clearly, composting can be a win-win endeavor. It allows you to cut down on the amount of unused food that otherwise would end up in a landfill. It creates a great, nutritious supplement for your garden. Why not plan to begin a compost pile as your next garden project? Late summer and autumn are not always the most beautiful and fruitful times for many of our plants. Our vegetable patches have stopped yielding and our flowers are faded and brown. But this is the perfect time to gather seeds you can use to start your gardens next year. Here are just a few benefits of collecting and saving seeds. It’s economical! The price of a packet of seeds seems to increase every year. The seeds you collect from your garden are free. You can share or exchange seeds with friends – a great inexpensive way to try new plants. Your favorite plant may not be readily available at local nurseries, but if you save seeds you can continue to enjoy it in your garden year after year. Many varieties of heirloom plants are lost over time. They actually become extinct! You can help preserve different heirloom plants by collecting, saving and replanting heirloom seeds. By raising many generations of plants, you’ll be able to see how certain traits are passed on, and how you can select the qualities you want to bring out. Over time, you can even “customize” your plants to suit your backyard conditions and your tastes. You can benefit your community. If you collect more vegetable seeds than you can use, which is likely, you can donate your surplus seeds to a community garden that gives free fruits and vegetables to needy families. Collecting and saving seeds is an ancient tradition. For thousands of years, farmers collected and saved seeds to insure the next year’s harvest. They also studied the results of their plantings and then saved and sowed seeds from the best plants, fine-tuning the plants to meet their needs and match local growing environments. This selection led to a genetic diversity of crops adapted to many growing conditions and climates, and created a large base for our food supply. While farmers and hobby gardeners collect and save seeds to plant and share, seed vaults or banks do just the opposite. From the beginnings of agriculture (possibly as early as 8000 B.C. in what is now Iraq), farmers understood their seeds needed protection from the weather and animals. Scientists have discovered evidence of seed banks in Iraq from as far back as 6750 B.C. Today, there are more than 1,500 seed banks around the world that hold a wide variety of seeds to preserve crop diversity and act as insurance against disease and natural and man-made disasters that might wipe out the world’s seed reserves. The best known is the Svalbard Global Seed Vault, often called the “Doomsday Vault,” located in a remote frozen mountain in Norway. 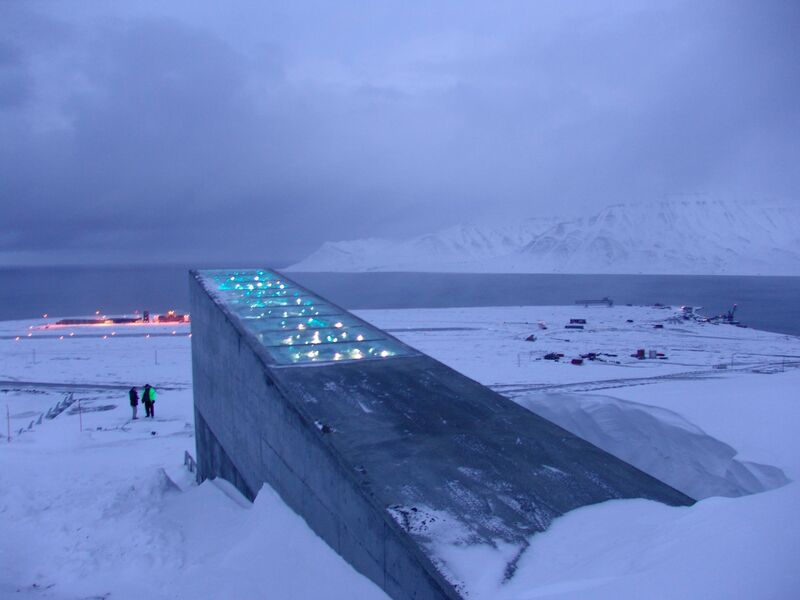 The Svalbard Global Seed Vault is a huge international project with the capacity to store 4.5 million varieties of crops for a maximum of 2.5 billion seeds. Currently, the Vault holds more than 860,000 samples, originating from almost every country in the world. 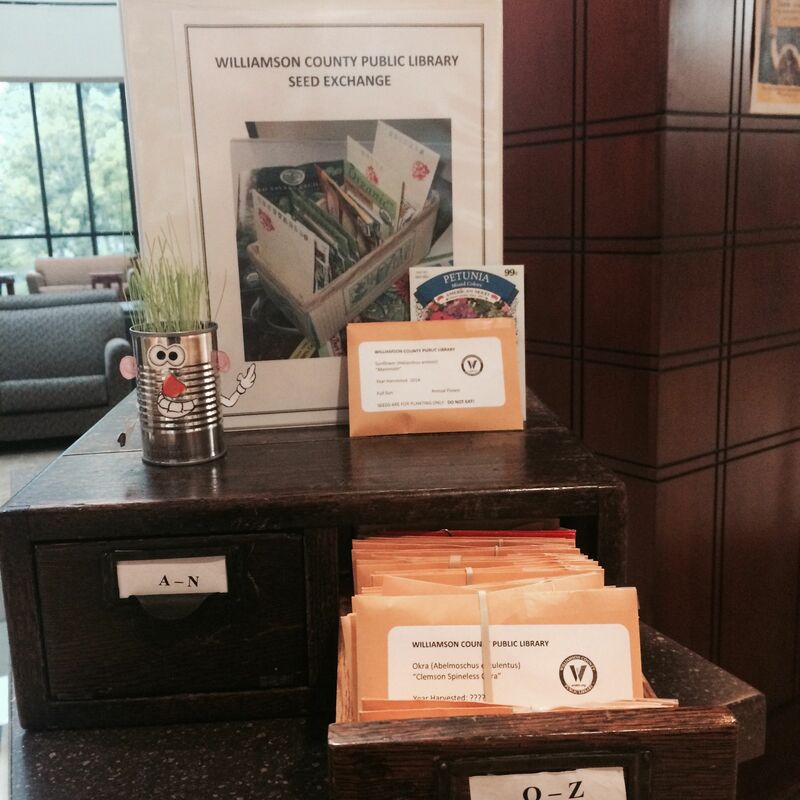 Amid all the interest in preserving and sharing seeds, libraries around the country have started seed exchanges, and the Williamson County Public Library joined that movement in March of 2015. The first year of our seed exchange, we “checked out” (gave away) more than a thousand packets of flower, vegetable, fruit, and herb seeds. It was suggested – but not required – that those who participate in the program collect seeds from their gardens this fall and return a few of them to the Library in the spring so we can keep our seed exchange going. Go to WCPL Seed Exchange to find out how our seed exchange works and see a list of helpful resources on seed collecting. If you want to learn more about harvesting your seeds, the Library is hosting a program on Collecting and Saving Seeds with UT/TSU Horticulture Extension Agent Amy Dismukes on Monday, September 17 at 1:30 pm. Registration is required, but the program is FREE and open to anyone who is interested in attending. Just call 615-595-1243 or click here to register. It’s that festive time of year when you start planning parties, decorating your home, and picking out and wrapping the perfect gifts. If you’re looking for great ideas for holiday entertaining, crafts, decorating, homemade gifts, and recipes, the Williamson County Public Library is a great place to start. The main branch in Franklin and our branches in Bethesda, College Grove, Fairview, Leiper’s Fork, and Nolensville all have books, magazines, electronic resources, and even classes and programs to help make your holiday season jolly! Browse through our Decorative Arts section (call number 745.59412) to find books on hand-crafted gifts, contemporary and vintage Christmas crafts, holiday decorating, and traditions. You’ll see everything from crafting with children to “green” Christmas decorating. Make your home warm and inviting for the holidays with these Christmas home décor books, also found at call number 745.59412. Get DIY ideas and tips from top decorators on everything from trimming the perfect tree to creating an elegant centerpiece to crafting wreaths and garlands to using candles to set just the right mood. Happy browsing! Want to host the perfect Christmas gathering? Check out these books on holiday entertaining found primarily at call number 642.4, with a few more in 745.59412. These books combine tips on cooking, decorating and entertaining – everything you need for a fabulous party. Food, Glorious Food! WCPL has holiday cookbooks galore. From traditional comfort foods to decadent desserts to healthier holiday fare, you’ll find it at call number 641.5686. Below are just a few sample titles. Happy cooking…and eating! In addition to books, WCPL also offers a variety of periodicals featuring great holiday tips. Decorating Digest Craft & Home Projects (PER DEC) has a holiday projects edition each fall. Cooking Light (PER COO) and Bon Appétit (PER BON) focus on holiday recipes in their December issues. We carry several “lifestyle” magazines that go all out in their holiday editions. Southern Living (PER SOU), County Living (PER COU), Real Simple (PER REA), Family Circle (PER FAM), Good Housekeeping (PER GOO), Better Homes & Gardens (PER BET), House Beautiful (PER HOU), Redbook (PER RED), O, The Oprah Magazine (PER O) and more titles all feature recipes, entertaining, decorating, and crafts in their December or winter issues. At the Main Branch in Franklin, the periodicals are on the second floor near the reference section. Eager to check out some of our holiday books and magazines but can’t make it to the library? We have digital magazines and eBooks that you can access at home or on the go. Through Tennessee READS-OverDrive you can download eBooks on your computer, eReader, smart phone, or tablet. Tennessee READS offers a huge selection of current titles on Christmas decorating, cooking and entertaining. Stop by the Reference Desk at the Main Branch in Franklin for hands-on assistance setting up your READS-OverDrive account. Instructions for downloading electronic titles are also available at wcpltn.org for the OverDrive app and for Kindle eReaders. WCPL also offers digital magazines that you can read on your computer, smart phone, or tablet. Zinio, the Library’s digital magazine collection, has recently merged with RBdigital. Instructions for downloading digital magazines using the RBdigital software and app will be on our website soon. WCPL offers fun holiday classes and programs. In our “Holiday Newsletter Class” you can learn to create your own holiday newsletter using Microsoft Publisher. You can also take our “Picmonkey Christmas Cards” class to learn how to turn your personal digital photos into holiday cards using the Picmonkey software program. In our “Crafty Adult” series of programs at the Main branch in Franklin, you can learn to make crafts for all occasions. At the next program on Tuesday, December 5, you’ll be able to create your choice of two 3D Christmas card designs. To sign up for the program, call 615-595-1243, ext. 1 or register online at 3D Holiday Cards. If the Library’s resources haven’t satisfied your pursuit of holiday perfection, give Pinterest a whirl. Log in to Pinterest and just search for Christmas crafts, decorating, cooking, and entertaining. You’ll find more creative ideas than you can shake a glue gun at. All of our holiday resources should really put you in the Christmas spirit. But don’t go overboard! Debt-Proof Your Christmas: Celebrating The Holidays Without Breaking the Bank by Mary Hunt (322.02402 HUN) can help you enjoy your holiday without stressing over your budget. It’s a chilly Sunday afternoon and the rest of your family is parked in front of the large screen watching a football game. You, however, are nestled into your favorite comfy chair in front of a glowing fireplace, steaming cup of tea in hand, a soft throw over your knees. You sigh happily as you open another installment of your favorite “Miss Marple” mystery series. This singular pleasure was brought to you courtesy of Agatha Christie, one of the creators and the chief purveyor of the mystery genre known as the “Cozy.” Forty-one years after her death in 1976, Agatha Christie is still one of the top-selling authors of all time, with novel sales in the billions. This September marks the 127th anniversary of Agatha’s birth. So in Agatha’s honor, we’ll look at this traditional mystery genre closely associated with her novels, and explore ways to find works by other authors that will appeal to Cozy fans. The heroine of Charlaine Harris’ Aurora Teagarden series is a librarian. Mystery fiction is divided into several major categories. Hard and Soft Boiled Mysteries generally feature a seasoned professional detective who often must contend with personal demons while investigating a crime. Procedurals offer blow-by-blow analysis of how a crime is solved, either by detailed detective legwork or scientific investigation. Thrillers and Suspense novels don’t always hinge on solving a crime or murder that occurs at the start of a novel, but instead focus on some ever-intensifying threat to the protagonist and feature lots of plot twists. There are also countless mystery sub-genres – Capers, Domestic, Historic, Noir, Romantic Suspense and True Crime, to name a few. Instead of a hard-boiled detective, the Cozy crime solver is an amateur sleuth who is almost always a woman. Agatha’s Miss Marple is a prime example. The amateur sleuth usually has some other vocation – caterer, chef, cat fancier, bed and breakfast owner, or librarian. In a Cozy, the setting is key! The setting of a Cozy mystery is critical and helps provide the novel its “cozy” character. It is often set in a small rural town or charming village, or in some cases a closed environment such as an isolated estate or even a train. The intimate nature of the setting allows most of the suspects to know each other. Bishop’s Lacey, the quintessential English village featured in Alan Bradley’s delightful Flavia de Luce series, and Cabot Cove, the location of Donald Bain’s “Murder, She Wrote” novels, both illustrate the perfect Cozy setting. The amateur sleuth is not a police officer or forensics expert, but almost always has a friend or significant other who is one. Through this friend, our sleuth gains access to information, such as an autopsy report, not usually available to your average person. The local law enforcement tends to underestimate and dismiss the amateur sleuth, allowing her to “casually overhear” key details at a crime scene. Many Cozy Mysteries are parts of series. A Cozy usually features a “red herring” – a clue that steers the reader away from the actual criminal or suggests an inaccurate conclusion. The victim and possibly some of the suspects are often known to the amateur sleuth. They could be old college friends or coworkers. Cozies usually boast a cast of colorful, likeable, eccentric secondary characters who are often as important to the reader as the amateur sleuth. Cozy mysteries are often written as parts of a series. Readers become emotionally involved with the amateur sleuth and other recurring characters and feel they’re “coming home” to a familiar place and old friends when they begin their next Cozy. There are MANY series to choose from, but a few notable ones include Agatha’s Miss Marple series, M.C. Beaton’s Agatha Raisin series, Nancy Atherton’s Aunt Dimity series, Louise Penny’s Chief Inspector Armand Gamache series, and the previously mentioned Flavia de Luce series by Alan Bradley (my personal favorite). Two intrepid Siamese, Koko and Yum Yum, help their human solve crimes in the “Cat Who” series. Cozies sometimes center around a hobby or theme – everything from cats and the culinary arts to knitting and holidays to tea shops and libraries. A link to a great list of Cozy mysteries arranged by theme is included in “Further Reading” at the end of this article. The good guys usually win and the evil-doers get their comeuppance. Once you’ve devoured all of Agatha’s Miss Marple mysteries, what’s next? The list of possibilities is literally endless. To help narrow the field, check out three of Agatha’s contemporaries who helped establish and refine the Traditional Mystery formula and, along with Agatha, comprised the four great “Queens of Crime”: Dorothy L. Sayers (1893-1957), famous for her Lord Peter Wimsey series, Margery Allingham (1904-1966), known for her Albert Campion series and Ngaio Marsh (1895-1982), creator of the Inspector Roderick Alleyn series. WCPL has a good selection of works by each of these writers. If you’re already a fan of Cozies or just ready to try them, one thing is certain — you won’t run out of reading material any time soon. See below for lists of works that will keep you reading for years to come. Enjoy…and stay Cozy! THINKING ABOUT ADOPTING A CAT OR DOG? “Who rescued who?” This touching (although grammatically incorrect) sticker seems to be attached to every other car bumper in Williamson County. As the sticker makes clear, giving a home to a needy animal does not only benefit the animal. But a successful pet adoption that works for both the animal and the adopting family is a serious undertaking that deserves careful consideration and lots of planning and preparation. It’s an obligation that can last more than a decade. Not everyone is up to the task. If you’re in the market for a new pet, the list of adoptable critters is endless – you can adopt homeless turtles, cockatoos, rabbits, horses, even spiders! Since we’re in the middle of “puppy and kitty season,” when shelters are swamped with unwanted litters, let’s concentrate on the ins and outs of dog and cat adoption. Save a life. Each year 2.7 million adoptable dogs and cats are euthanized in the U.S. This number could be reduced if more people adopted pets instead of buying them. Get a great animal. Shelters are full of wonderful, healthy animals, many of whom ended up there through no fault of their own. It costs less. A purebred dog or cat purchased from a breeder can cost hundreds, even thousands, of dollars. The MUCH lower adoption fees often include the cost of spaying/neutering, first vaccinations, even microchipping. You can fight puppy mills. If you buy a dog from a pet store, online seller or flea market, there’s a good chance it will come from a puppy mill. Puppy mills are breeding factories that put profit over animal welfare, and the animals often live in deplorable conditions. Puppies from the mills are often ill and have behavioral issues. By adopting a pet, you won’t be giving the puppy mills a dime. Your house will thank you. Lots of rescue animals are already housetrained. Give your rugs a break! Pets are good for you! Not only do animals give you unconditional love, but they have been shown to be psychologically, emotionally and physically beneficial to their companions. Caring for a pet can provide a sense of purpose and lessen feelings of loneliness. Adopting helps more than one animal. Many shelters are overcrowded, and when you adopt one animal, you make room for others. Adoption fees allow shelters to offer better care for their animals. You’ll change a homeless animal’s whole world and get a new best friend out of the deal! Included in the “Resources” section at the end of this article is a list of books about people whose lives have been improved by adopting an animal. Have a box of Kleenex handy when you read them. Think hard and ask yourself a lot of questions before you make the decision to adopt a pet. Why do you want a pet? As a travel companion? To cuddle with on the couch, go for strenuous runs and hikes, or something in between? Analyzing your reasons for adopting can help you determine what sort of pet to look for. What kind of dog or cat do you want? High energy or mellow? Large or small? Long hair or short hair? Affectionate or more independent? Male or female? Puppy or senior? Once you’ve decided what type of dog or cat works best for you and your family, stick with the decision. Don’t fall for the first adorable puppy or kitten you meet. Take your family’s feelings into consideration and make sure everyone is one board with bringing home a new pet. Can you afford a pet? The cost of food, regular vaccinations, spaying or neutering, toys and other supplies adds up. A serious injury or illness can break the bank. Do you have time to devote to a pet? Dogs, exotic birds, and cats need lots of daily interaction, but even “pocket pets” like mice and hamsters need supervised time outside their cages. If you work really long hours or travel a lot for work, adopting a pet might not be your best option. Do you have enough physical stamina to take care of a pet? Cats like a lot of play time and dogs have to be walked. Some high energy dogs need more than an hour of exercise a day. Are you honestly ready for the responsibility? Cesar Millan, the “Dog Whisperer,” offers this clue: Look at your closet. Is it neat and organized? That may sound odd, but Millan says the state of the closet has always been a true test of a person’s ability to provide a pet with a structured life that has rules, boundaries and limitations. Yikes – good thing nobody checked my closets before I got my dog! Are you prepared to handle some of the physical and emotional “baggage” that rescue pets can bring with them? So you’ve decided to adopt and you’ve found the right pet. There’s still a lot to do. The following should all be in place BEFORE you bring home your new pet. Create a plan with your family to divide up the responsibility of caring for your new pet. Who is expected to do what and when? Decide where your dog will stay during the day and where it will sleep at night. Pet proof your house. Put cleaning products, poisonous plants and any foods toxic to cats or dogs out of reach. Tape electrical cords to baseboards. Put away any small items that could be choking hazards. You might want to roll up and put away expensive rugs until you determine your new pet’s level of housetraining. Buy basic supplies. For a dog: high quality dog food, a crate of the appropriate size with a crate mat, food and water dishes, sturdy chew toys, a cozy bed, a collar with an ID tag including your cell number and address, a leash, dog shampoo, brush, and nail clippers. For a cat: High quality cat food, food and water dishes, litter box or boxes and cat litter, toys, a scratching post, cat shampoo, brush and nail clippers. Try to purchase the same kind of food the animal has been eating, and if you want to try a different brand, introduce it slowly by adding increasing amounts of the new food to the old food. Have an appointment already scheduled with a veterinarian so you can have your new pet checked out as soon as you collect it. Introduce family members and other pets in a controlled way. Try to do this in a calm, quiet manner. NEVER leave a new dog unsupervised around children. If you’ve adopted a dog, seriously consider using a crate, which will aid in house training and prevent destructive behavior. Feeding your dog in its crate and making sure the crate contains toys and a comfy mat may make it more appealing. WCPL has some good books that include tips on crate training. Spend as much time with your new pet as possible. A little exercise may make your new dog feel better. Check with your vet for your dog’s appropriate level of exercise and don’t overdo it. Keep things quiet and calm for the first few days. Don’t let your new pet get too excited. Realize that even if your new pet is already house trained, it may have a few accidents until it settles in. If you do your homework and follow through on the prep, planning, and day-to-day care of your new pet (with lots of love and patience tossed in), you will have an amazing addition to your family. I’m not ashamed to say that when I was a kid my two best friends were a dog and a cat. I can’t begin to describe all the ways these beautiful little creatures enriched my life. There are thousands of wonderful dogs and cats just like them out there who need great homes. Go rescue them! The following sites offer general information about pet adoption. If you are interested in a specific breed of dog or cat, many shelters often have purebred animals available. In addition, almost every breed has its own rescue organization. Just Google the name of the breed and “rescue” (for example, “basset hound rescue”). There are a lot of scary things in the world, and I’m not talking about the upcoming election. Literature and films are loaded with frightening monstrosities, but I’ll focus on three “classic” creatures – vampires, zombies, and mummies – and examine the origins of these horrors that have terrified folks for centuries. From Bela Lugosi to Gary Oldman and Robert Pattinson, everyone has a favorite movie bloodsucker. But the original vampires of legend weren’t as forlornly romantic as Oldman or as adorable as Pattinson. Ancient versions of the vampire weren’t thought to be humans returned from the grave, but were supernatural entities that didn’t take human form. There are many vampire variations around the world: an Egyptian vampire that was a demon summoned by sorcery, Asian vampires that attacked people and drained their life energy, the blood-drinking Wrathful Deities that appeared in the Tibetan Book of the Dead, and many others. Belief in vampires surged in the Middle Ages in Europe. Any unfortunate event that befell a person or village with no obvious cause, such as disease or crop failure, could be blamed on a vampire. Villagers combined their belief that something had cursed them with their fear of the dead, and concluded that the recently deceased might be responsible, returning from the grave with evil intent. “The Vampyre,” the first fully realized vampire story, was written by John Polidori, personal physician to Lord Byron (the haughty Byron often belittled his young employee). In 1816, Percy Shelley and Mary Godwin joined Byron and Polidori at Byron’s villa on Lake Geneva. Byron suggested that his guests each write a ghost story. Mary’s tale became the novel Frankenstein. One theory is that Polidori, inspired by his resentment of Byron’s arrogant treatment, based his character Lord Ruthven, a charming aristocratic vampire, on the poet. But when Polidori’s story was published in 1819, it was credited to Byron. Polidori tried to prove his authorship, but was accused of misusing Byron’s name. The most famous appearance of a vampire in literature was Bram Stoker’s Dracula in 1897. Like Polidori’s vampire, Dracula appeared as an aristocratic gentleman. It’s often assumed that Stoker’s Count Dracula was inspired by Vlad Dracula, a real-life prince cited as an influence for modern personifications of vampires. Known as Vlad the Impaler because of the gruesome method he used to kill his enemies, he is considered a national hero for the extreme measures he used to defend his Romanian principality in the 15th century. Historians have implied but never proved that Vlad drank the blood of his enemies. Stoker’s novel was popular in the Victorian age, but it wasn’t until the 20th century film versions that it became iconic. The first adaptation of Stoker’s novel, the silent German film Nosferatu, was controversial because of its departures from Dracula – instead of being charming, Nosferatu was a vile character, and instead of drinking his victim’s blood to create new vampires, he spread rats and plague. The most influential adaptation of Stoker’s work was the 1931 film Dracula, starring Bela Lugosi. His performance inspired future actors who took the role and was a factor in making horror films a viable genre in the U.S. market. In the 1950s and 1960s, Christopher Lee played Dracula in a number of violent adaptations. Since then Count Dracula has been portrayed more times in film and TV than any other horror character. Now vampires are everywhere – in Anne Rice’s Interview with the Vampire, in Charlaine Harris’ Sookie Stackhouse novels (depicted on TV in True Blood), the Stephenie Meyer’s Twilight series, the TV series The Strain and Being Human, and countless others. Those shambling creatures intent on devouring Rick Grimes and his dwindling band of survivors bear little resemblance to the earliest incarnation of the zombie. The word “zombi” originally didn’t refer to the familiar brain-eating monsters but instead to a West African deity. It later came to suggest the human force leaving the shell of a body, and ultimately a creature human in form but lacking self-awareness, intelligence, and a soul. The notion was imported to Haiti and elsewhere from Africa through the slave trade. In Haiti and the Caribbean, zombies are an element of the voodoo religion and believers take them seriously. Haitian zombies were said to be people brought back from the dead (and sometimes controlled) through magical means by voodoo priests called bokors, often as an act of punishment. Zombies were supposedly used as slave labor on farms and sugarcane plantations, although none of these zombie-powered plantations was ever discovered. Westerners considered zombies fictional horror film characters until the 1980s when a scientist, Wade Davis, claimed in his book The Serpent and the Rainbow to have solved the mystery of the zombie. The work met much skepticism. Davis asserted that he found the actual powder used by the bokors to create zombies – a neurotoxin called tetrodotoxin that could bring on the appearance of death. Early zombie films, most notably White Zombie in 1932 and I Walked with A Zombie in 1943, acknowledged the zombie’s voodoo roots. George Romero’s 1968 film The Night of the Living Dead introduced the current popular characterization of the zombie as a flesh-eating creature. Romero’s film established common themes in current zombie films – the zombie as a metaphor for societal unrest and alienation; unconventional protagonists (hello, Daryl Dixon); and humans reduced to “survivalist” mentality. Romero’s zombies attack in groups and can be killed with a blow to the head. Recent zombie films – 28 Days Later, Shaun of the Dead, Zombieland, World War Z, Pride and Prejudice and Zombies, and of course, The Walking Dead – feature elements of Romero’s films and ignore the voodoo connection. Unlike vampires and zombies, mummies are not based on myth or legend. They are actual human corpses, preserved by a special method of embalming. Mummies have been found all over the world. But in ancient Egypt the mummification process was honed to a fine art over centuries, with the best prepared and preserved specimens, including Tutankhamen and other pharaohs, dating from around 1560 to 1075 B.C. The technique worked so well that after 3,000 years, we can still tell what the deceased looked like in life. The elaborate procedure, as much a religious ritual as a technical process, took at least 70 days. The basic method was to remove organs except the heart through a slit in the body’s side. The brain was removed through the nostrils with a hooked instrument. The organs were preserved in jars and placed inside the body. The body was covered in natron, a salt with drying properties. Once the body was dry, sunken areas were filled with linen, sawdust, and other materials to make it to look lifelike. The body was then wrapped in hundreds of yards of linen strips. Finally a shroud was secured to the body and it was buried in a tomb along with objects the person would need in the Afterlife. Throughout the entire process, rituals and prayers had to be performed precisely. Why expend so much time and effort to preserve a body? The Egyptians believed that the mummified body was the home for the soul or spirit, and if the body was destroyed, the spirit might be lost. How did a person so honored turn into the malevolent creature we know from films? Napoleon’s conquest of Egypt at the end of the 18th century sparked a European interest in ancient Egypt that was still strong in Victorian England, where public “unrollings” of mummies were held. In 1903, Bram Stoker published The Jewel of Seven Stars, the first novel featuring mummifies as supernatural antagonists. Howard Carter’s discovery of Tutankhamen’s tomb in 1922 fueled even more interest. Then came the famous Boris Karloff film, The Mummy. Released in 1932, it was based on the concept of “the pharaoh’s curse” (that anyone who disturbs a tomb would die) and featured the mummy Imhotep as an evil high priest. It set the stage for a slew of mummy films through the 1940s and 1950s. Imhotep recently reappeared in the 1999 remake of The Mummy and its sequel, The Mummy Returns. Early film depictions of vampires, zombies, and mummies may seem a little dated and not that terrifying compared to the ultraviolence common in today’s horror films. But that might change. In 2014, Universal Pictures announced it would be rebooting its library of “classic” horror films, bringing new life to standard horror characters. The first release in this effort, The Mummy starring Tom Cruise, is due to hit theaters in 2017. An accomplished young woman goes missing and is presumed murdered. Is her cheating husband the culprit or is she deviously punishing him for being unfaithful? After a massive search and media frenzy, she turns up alive. Sound like the premise of Gone Girl, right? Guess again. This actually happened to one of the world’s most beloved novelists! The titles Murder on the Orient Express, Death on the Nile, And Then There Were None might seem a bit familiar as some of the best known mysteries by the queen of whodunits, Agatha Christie. September 15 marks the 126th anniversary of Agatha’s birth in 1890. During a career that thrived from 1920 until her death in 1976, she penned 66 detective novels, 14 short story collections, the world’s longest running play (The Mousetrap), and created the beloved fictional detectives Hercule Poirot and Miss Marple. She also wrote romance novels under the pen name Mary Westmacott. Her intricately plotted tales of love, murder, greed, and jealousy have sold more than a billion copies, making her one of the most popular writers of all time. But in 1926 Agatha, already an established writer, became the subject of a mystery herself – one that has never been solved. She simply vanished one wintery evening. She was found safe 11 days later, but with no memory or explanation of what had happened to her. At 9:45 on the evening of December 3, 1926, 36-year-old Agatha Christie kissed her sleeping daughter Rosalind, and then drove away from Styles, her English estate. Her abandoned vehicle was found on a slope not far from her home with the hood up and lights on. There was no sign of Agatha, but her fur coat, driver’s license, and overnight bag were still in the car. Her car had been left near “the Silent Pool,” a natural spring where several children reportedly had died. There was much speculation that she had drowned herself or had been murdered and a massive search ensued. The search for the author (whose recent novel, The Murder of Roger Ackroyd, was already selling briskly) was at the time the largest manhunt in British history with over 1,000 officers and 15,000 volunteers on Agatha’s trail. A fleet of planes was employed – the first time they’d been used in England in a missing person’s case. Even Sir Arthur Conan Doyle got in on the action, taking one of Agatha’s gloves to a famous medium. Dorothy L. Sayers, creator of the Lord Peter Wimsey mystery series, examined the scene around the abandoned car. Their efforts turned up no clues. By the end of the first week, Agatha’s disappearance was a national obsession, and was reported on the cover of the New York Times. Theories abounded. Some thought the disappearance was a publicity stunt to boost sales of her latest book, but it was already selling well before she vanished. Others thought she might have been injured in a car crash and wandered off suffering from amnesia. But the car showed no sign of an accident. Some also suggested that Agatha was missing because of her husband’s affair. Her husband, Archie Christie, a former Royal Flying Corps pilot, didn’t hide his philandering ways from his wife. He was currently having an affair with Nancy Neele, a young friend of the couple, and Agatha’s car was found near a house where her husband was planning a rendezvous with Nancy. This suggested to some that Agatha was trying to thwart the affair, or even frame Archie and Nancy. Many even suspected Archie had killed Agatha. On the 11th day of her disappearance, Agatha was recognized by a musician at the Swan Hydropathic Hotel, a luxury spa in Harrogate. She had registered there as “Theresa Neele” from Cape Town, curiously using the last name of her husband’s mistress. Later Agatha’s husband claimed that she was suffering from complete amnesia – she reportedly didn’t know him when he came to collect her at the hotel and she had also failed to recognize herself in newspaper photos during her stay there. Agatha, her family, and friends maintained a lifelong silence about the lost 11 days. So the mystery remained a mystery. After the incident, Agatha resumed her prolific writing career, which continued with enormous acclaim for many decades. She also divorced Archie in 1928 and made a happier match with the renowned archaeologist Max Mallowan in 1930. They were married until her death. In his 2006 book Agatha Christie: The Finished Portrait, Andrew Norman advanced a new theory that during her disappearance Agatha was experiencing a rare deluded condition called a “fugue state” — a psychogenic trance brought on by trauma or depression. The facts of her life in 1926 seem to back up his conclusions. Her mother passed away, and with immense sorrow Agatha spent a great deal of time alone clearing out the family home. This added strain to her marriage. She was also struggling to write her next novel. To top it off, Archie revealed he had fallen in love with a family friend, Nancy Neele. Agatha completed her autobiography when she was 75, and one might assume this work would offer the definitive explanation of those 11 days in 1926. Wrong! Not one word about the disappearance is included. Still, Agatha offers some clues about her state of mind around the time of the incident that seem to bolster Andrew Norman’s theory. Of her time spent cleaning out her late mother’s house, she writes, “I began to get confused and muddled over things. I never felt hungry and ate less and less. Sometimes I would sit down, put my hands to my head, and try to remember what it was I was doing.” She later mentions her extreme loneliness and a sense that she was ill. She once started to write a check and could not remember her name. She also suffered a meltdown when her car wouldn’t start. Years later, she believed she had been suffering a nervous breakdown. Could Agatha have been offering an explanation of her odd disappearance, or was she covering up the fact that the incident was an elaborate hoax? Almost 90 years later, the story of the missing author still sparks the imagination and has found its place in popular culture, a lot. While not touching on the disappearance, Agatha’s semiautobiographical novel Unfinished Portrait mirrors the disintegration of her first marriage to Archie at the time of the event. Dorothy L. Sayers, who failed to solve Agatha’s disappearance, used elements of it in her novel Unnatural Death. The disappearance was the subject of the 1979 film Agatha starring Vanessa Redgrave as the author and Timothy Dalton as Archie. There are also two new movies in the works about Agatha, one reportedly starring Emma Stone and the other Alicia Vikander. And of course, the Doctor Who episode “The Unicorn and the Wasp” offered a completely plausible explanation of Agatha’s disappearance involving a giant alien wasp (Series 4, Episode 7). It makes complete sense. We’ll never know what really happened to Agatha Christie in December of 1926. The incident remains the greatest mystery in the life of one of our greatest mystery writers. What’s In a [Pen] Name? “Pseudonym” comes from the Greek pseudonymos, meaning “having a false name, under a false name,” and writers have used pseudonyms or pen names for centuries. Everybody knows that “Mark Twain” was the pen name for Samuel Clemens, and by now most readers have figured out that “Robert Galbraith” (The Cuckoo’s Calling and The Silkworm) is a pseudonym for Harry Potter creator J.K. Rowling. But did you know that “J.K. Rowling” is also a pseudonym? Rowling’s real name is Joanne (no middle initial) Rowling! Why would an author choose to write under a different name? And just who are some of these writers who’ve pulled the literary wool over readers’ eyes with alternate identities? A more extreme example is provided by horror master Dean Koontz. Throughout the 1970s, Koontz published as many as eight books a year, and since his editors told him that writing in different genres under the same name was a bad idea, and risked serious overexposure, he chose some aliases: “Aaron Wolfe,” “Brian Coffey,” “David Axton,” “Deanna Dwyer,” “John Hill,” “K.R. Dwyer,” “Leigh Nichols,” “Anthony North,” “Owen West,” and “Richard Paige.” Koontz is suspected of using other names as well, but only admits to writing under these ten pen names. Nevil Shute Norway published his novels, including A Town Like Alice and On the Beach, as “Nevil Shute” to protect his aeronautical engineering and business careers. Renowned Egyptologist Dr. Barbara Mertz is better known as “Elizabeth Peters,” writer of the bestselling Amelia Peabody mystery series. Sir Walter Scott wrote Waverly and other novels anonymously to protect his reputation as a poet. “Ann Landers” was a pen name created by the popular advice column’s original author, Ruth Crowley, who didn’t want it confused with another column she was writing about child care. Joe Klein, TIME magazine political columnist, wrote the novel Primary Colors, based on Bill Clinton’s first presidential campaign, as “Anonymous” and went to great lengths to protect his true identity. It turns out that some well-known writers never existed at all! The Hardy Boys series by Franklin W. Dixon was written instead by several ghostwriters. Likewise, the Nancy Drew and Dana Girls series were not the work of Carolyn Keene, who didn’t exist, but by different ghostwriters. Laura Lee Hope, credited with The Bobbsey Twins series, was also just a pseudonym for several ghostwriters. No matter why a writer chooses to use a pseudonym, whether to mask gender, explore different genres, or maintain professional and personal privacy, key results are the unlocking of creativity, the freedom to write as one pleases, and the opportunity to have one’s work made available to readers. Without the use of pen names, some of literature’s greatest masterpieces (and works of popular fiction) might never have been written or published.